It’s a classic story: A small town girl goes to the big city, finds fame when she least expects it, but in her heart she still pines for the life she left behind. If you’re from the eastern shore, pining for home would include a trip to Ocean City for some summer rays, a box of salt water taffy and an afternoon at the Jolly Roger. This Saturday night, at the Ottobar, Delmarva girl (and Baltimore burlesque’s Queen of Crabs) Sunny Sighed will, in a sense return to the scene of the crime in a madcap farce called Goin’ Downee Oshun! The Baltimore Post-Examiner caught up with Sunny Sighed after a recent event at the Ottobar, where she was busy promoting this Saturday’s sun-drenched opus. BPE ~ In Goin’ Downee Oshun, you play a small town girl from the eastern shore. Kay Sera told us there are some biographical elements to this show. Without giving away the store, could you tell us a bit about your background? SS ~ I grew up on the Eastern Shore of Maryland, so I am truly from “Downee Oshun”! I stayed there from the age of 3 until I went off to college at the age of 18. BPE ~ When did you begin to study drama and music? SS ~ I started dance classes at a very young age and studied music from the time I was in fourth grade but didn’t really get into theatre until high school. I was a part of our Visual & Performing Arts program (VPA) my junior and senior years, so much of my schooling has been focused on the performing arts. Even though I didn’t study voice until a later age, I’ve loved singing my whole life! I started voice lessons and community theater productions in high school, attended summer camps for theatre, took part in All-Shore band and orchestra, All-state orchestra and All-state choir, was Drum Major of my high school’s marching band…all the dorky things performing arts kids do! BPE ~ Do you have any favorite roles or musical shows/numbers/composers? SS ~ My favorite role was playing Violet in the musical “Violet”. She’s like the Hamlet of female music theatre performers. I also love Sondheim – my favorite musical of all time has to be “Sweeney Todd”! But there are so many great shows, composers, numbers out there – many of them you’ll see me turn into burlesque! 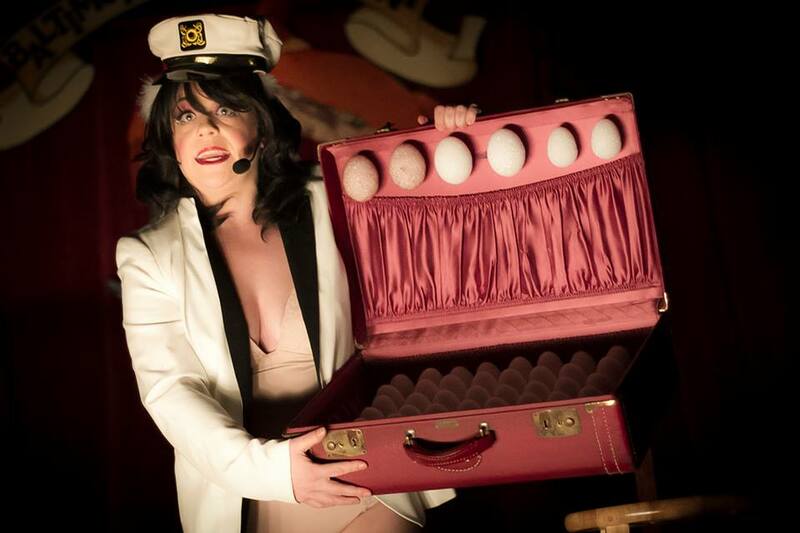 BPE ~ Please talk a bit about your evolution as a burlesque performer. How did you come onto the scene? SS: When I first moved to Baltimore, I never could have imagined taking my clothes off in front of others. I was soon introduced to Trixie & Monkey, who were still living in town at the time, and I was mesmerized. I began attending as many burlesque shows as I could and obsessed over every shimmy and shake. I was personal friends with Trixie & Monkey as well, having met them through mutual friends and family members when I first moved to town, so when Trixie learned that my partner Bal’d (Lightning), my sister and myself all play the French horn, I was lucky to be included in her plan for live music at the Spectacuthon. Trixie also knew that I am a singer and began including some vocal songs for me to sing in the show. Finally, I worked up the nerve to ask her if I could sing and strip at the show, and luckily she told me yes! I premiered in the 2010 Spectacuthon under a pseudonym (not wanting to give up my true identity yet) singing and stripping to “Let’s Put the X Back in Christmas.” My first official burlesque performance with Bal’d was the following April in “Birdcage Burlesque,” a showcase of new performers. BPE ~ Are there any past or present performers (Hollywood, Broadway, burlesque) you look to for inspiration? SS ~ Too many to mention here, but I can say that my burlesque performances have been strongly influenced by Dr. Lucky and Julie Atlas Muz, and I wouldn’t be a burlesque performer at all if it weren’t for Trixie Little & the Evil Hate Monkey. These performers do the kind of meaningful, edgy, often goofy performance art that motivates me to keep pushing myself to a higher level. BPE ~ Do you have a favorite routine? Either one of your own or someone else’s? SS ~ I have SO many – but to name a few, Trixie & Monkey’s “Kama Sutra” is inspiring, Julie Atlas Muz’s “Breakin’ the Law” is poignant while still being hysterically funny, and Ms. Tickle’s “Wings of Desire” made me cry when I saw it. I’d say my favorite routine that Bal’d and I do is a tie between “Marlboro’s” and “Little Lamb,” although there are currently some new favorites in the making. BPE ~ Most people believe you won the Queen of Crabs crown on the strength of your creative and hilarious John Waters tribute “The Sound of the Eggman”. Please tell us a bit about how you shaped that routine and the music selection behind the number. SS ~ “The Sound of Eggman” (with music by Richard Rodgers, Book/Lyrics by John Waters) was inspired by the scene from “Pink Flamingos” in which Edith Massey meets and speaks with the Eggman. In fact, the lyrics are the lines from the movie word-for-word, which is why it is important to me to credit John Waters as the author/lyricist. You can see the original scene on YouTube. BPE ~ How (if in any way) has winning the title of Queen of Crabs changed your life? SS ~ Being the Queen of Crabs has been an honor and a thrill! I’ve met so many new friends and feel like I have really connected to Baltimore and its people – I love our weird, quirky town! BPE ~ A few minutes ago, you mentioned Bal’d Lightning. You’re often paired on stage with Bal’d plus he is your real life partner. Is there anything you’d like to say about him that we can print in a family friendly publication? Bal’d has a huge brain, is really great in all of our acts and knows just how to capture an audience. He’s also the best damn sound designer I’ve met! BPE ~ One final question. In winning Queen of Crabs last fall, you beat two of your current co-horts – Ruby Rockafella and Kay Sera. As late as this past April, there were some snide remarks exchanged at the opening of MICA’s Workin’ The Tease. Now that you’re working together, are there any lingering hard feelings? SS ~ Let’s put it this way – I love them both, but I don’t walk in front of them when I’m going down stairs. Bawdy Shop Burlesque presents Goin’ Downee Oshun this Saturday, August 30, at The Ottobar 2549 N Howard St, Baltimore, Md. Doors open at 8 pm, show at 9 pm. Tickets $15 in advance, $20 at the door and are available at Ottobar, Charmington’s, or online via MissionTix.